Few cities will be commemorating December 7th, 1941, this year, although that is a date that still "lives in infamy", as President Franklin D. Roosevelt declared at that time. The Fate of America was put into jeopardy on that day, when Imperial Japan dispatched a contingent of aircraft carriers with "Japanese Zero" aircraft, to the Hawaiian Islands and began bombing and strafing our military base at Pearl Harbor in Hawai'i. Over 2,400 serviceman and civilians were killed, and four battleships were sunk, in a single day that triggered the involvement of America in World War II, against Germany, Japan, and Italy. While many of us don't remember this time, since it was over 76 years ago, details are easy to find in history books, and there are still numerous documentaries about that fateful day and the war that followed. What piqued my curiosity was what were the residents of Sellwood, Westmoreland, and elsewhere in Inner Southeast thinking and doing, when the United States entered a war that had already been underway for two years in Europe? Most of the information I compiled about the time during the war is from THE BEE, and from past interviews of local residents who lived through the decade of the 1940's here. Before the war, Inner Southeast – like the rest of the nation – was still feeling the effects of the worldwide economic depression of the 1930s. Jobs were finally slowly becoming available, and residents found everyone, from the elderly to schoolchildren, happy to help each other. Young people, like the Bechold kids who lived on Sherrett Street, often volunteered to water their neighbors' gardens, pick up an item for them at the store (only two blocks away, on the corner), or stack canned food at the pharmacy, in exchange for an ice cream cone or a simple thank-you. There were people here still living in fear, out of work, with little if any money, and wondering where their next meal would come from – but neighbors held weekly potlucks to share with others what little they had. Those with plenty of food were able to offset the shortage from others. Get-togethers for those who enjoyed singing, dancing, and playing card games occurred almost weekly, and many men joined one of the local social groups. Fraternal groups "for men only" then included the Masons, the Elks, the Redmans Club, and the IOOF. Ladies' clubs included church groups like Dorcas, the Society, the Blackmars, the Rebeccas, and the Lavender Club. Playing cards and having tea and desserts were the highlight of every gathering. Almost every student knew how to play an instrument, and Sellwood had its own band which could be hired out for special performances and summer events. Life went on as usual in the city of Portland, as it did in many other cities around the nation. The Westmoreland Community Club and the Sellwood Commercial Club were making plans for their monthly dances and events to raise money for the community. Portland Mayor Early Riley was preparing the city for a homecoming celebration for the military troops of the 41st Division in 1941, as reported on the front page of the THE BEE. Nearly 6,500 solders, many from around Oregon, were expected to set up tents in a temporary camp on Swan Island. A huge barbecue was planned for the young men, with meat provided by the State Game Commission, to be prepared by various Greek restaurant owners in Portland. Besides a parade and free accommodations and food, the city also made arrangements for dancing, free admission to any movie theater, and free transportation from Swan Island to the downtown city lights. Little did anyone know that within the next few days those preparations would be canceled after the attack on Pearl Harbor. The servicemen who planned on visiting Portland on their way to Camp Lewis in the State of Washington would be deployed immediately into military action. Most of those living on the West Coast were unprepared and shocked when news arrived of the bombing at Pearl Harbor in December of 1941. News was slow to come, and the wait for it was agonizing for family members whose sons and fathers had enlisted in the military, and it took nearly two weeks before THE BEE could print a list the first local casualties. Eighteen year old John E. Burges, who had attended Sellwood School, was killed in action aboard a ship at Pearl Harbor on that fateful day. His family was informed of his death by a cable from the State Department two days later. 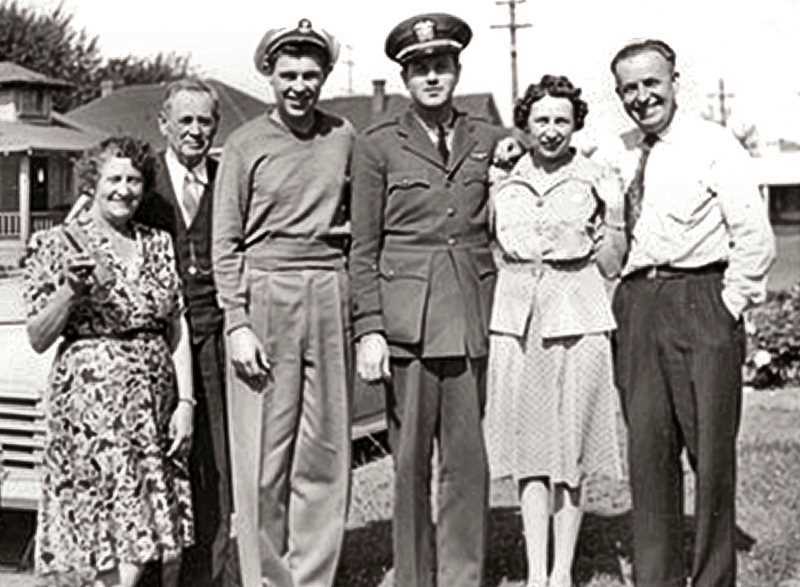 The parents of Burr McKinley were relieved when they found out that their son had survived the sinking of his ship, the U.S.S. Oglala – a vessel which had also served in World War I. Much of the news sought so anxiously by local residents was delayed, however, due to government officials who feared giving out any information, even to the public, would comprise the nation's security and reveal the weakness or strength of military operations. Mr. and Mrs. Ernest Hall had to wait in agony for the whereabouts of their son Burson. His parents last heard from him when he was stationed in Hawai'i. The only reply they could get from the war department was that they didn't know where he was, or even if he was still stationed at Pearl Harbor during the invasion. It was such constant worry and concern that parents and loved ones would have to live through during World War II; the nation was on pins and needles listening to news updates on their radios. This was the first major conflict since radio had become popular, and network commentators like H.V. Kaltenborn and Edward R. Murrow, reporting from war areas overseas, became familiar voices in Southeast homes. The fighting spirit and patriotic feelings of the citizens stayed strong during the war era. The people united by contributing to the war cause in many ways. At Sellwood and Brooklyn Schools, "Victory Gardens" were planted and maintained on or near school grounds, cared for by students, to grow vegetables in anticipation of food shortages. So many men had rushed to sign up for military service that many farmers became desperate for laborers to help harvest their crops. Workers were in short supply in every industry due to all the enlistments, and rationing became a way of life for every American as industries geared up to supply the war effort. War Bond sales and collection drives were begun, and every citizen was expected to pitch in and support the cause. The ladies of Sellwood had already started a Red Cross drive two months before the declaration of war, and they continued to meet regularly at the Sellwood Community House. A scrap-metal drive was started immediately, relying on children going door-to-door and collecting whatever metal anyone could contribute. Geri Griffith, who attended Sellwood School, was curious about why suddenly all the teachers looked old. That was because many of the male teachers had signed up and been sent overseas as solders, so the school district had to hire teachers who had retired years before. Photos of the 1945 senior class at Commerce High School (it wasn't until 1949 that it became Cleveland High) revealed just five boys graduating among the class of 105. Many of the boys had managed to join the military, even though they were under-aged. Mobilization was quickly instituted in the neighborhood. Air raid warning sirens for use in blackout conditions were installed at the Sellwood Fire Department. Households were given instructions about keeping windows covered with black paper at night, to prevent lights showing which could alert any enemy aircraft to the location of the city. In 1941, just before the outbreak of the war here, the government contracted industrialist Henry J. Kaiser to develop a ship-building operation at Swan Island in North Portland. The Portland Airport had been located on Swan Island, but a new location for it near 40th and N.E. Marine Drive was completed in 1940. Within the next year, another shipyard was constructed in the St. Johns community along the Willamette River, and yet another across the Columbia River at Ryan's Point in Vancouver, Washington. Skilled workers and laborers were needed for wartime production, and many jobs were advertised widely. People flocked in from the South and the Midwest to fill them. By 1942, over 76,000 people had been recruited to the West Coast, and were kept busy locally working in these three shipyards. By the following year, over 97,000 men and women were working three different shifts around the clock in each one. More than 10,000 workers in the Vancouver shipyards were women, and the Kaiser ship-building operation provided an opportunity for African Americans to become proficient at a skilled craft at a high wage that elsewhere they had not had access to before. Housing for this huge influx of new workers was at a minimum, and residents of Sellwood and Westmoreland took to renting out rooms in their houses for them – or building new apartment complexes in the neighborhood. Six housing projects were built in the City of Portland to accommodate the increase, the most famous one of which being the ill-fated Vanport, and the Guild's Lake Project in North Portland. Locally, the Kellogg Housing Project, south of Sellwood and opposite Garthwick, in Clackamas County, was finished in the spring of 1942. The project included 100 single family dwellings that rented for from $7.50 to $12.00 per month. Limitations on applications were confined to families whose members were working in military institutions like the Kaiser Shipyards. The interurban trolley lines running through today's Springwater Corridor alignment provided cheap and easy transportation to their workplace on Swan Island or downtown. In 1942, President Roosevelt signed Executive Order 9066 to relocate Japanese Americans from the West Coast to interior sections of the U.S. First-generation Japanese Americans who were loyal to America were nonetheless forced to sell their property, furniture, and many personal belongings, and were sent to live in internment camps until the war ended. Grace Yasamura Aoki, who was a prominent teacher in the Portland School District, was just 12 years old when her six siblings and her parents were interned in a camp at Merced, California. Like many others, she didn't understand why they were being persecuted simply because of their nationality. Few newspapers mentioned that, the year previously, Roosevelt had signed Executive Order 8803, which barred racial discrimination in the war industry workplace. Machinery, small parts, and engines were almost impossible for civilians in Inner Southeast to purchase, as factories that once manufactured small industrial machines were now used to produce military weapons and materials. An example of this was the Saunter Spray Company in the Brooklyn neighborhood: Unable to order any new paint sprayers for the coming summer, they were down to only one good paint sprayer that had to be shared among all of the other commercial and residential house painters in the area. War news was on the minds of everyone here, and subscriptions to THE BEE – at the time, a paid-circulation weekly newspaper – reached an all-time high, as residents were anxious to stay abreast of local information coming from the worldwide war. Nearly eighty percent of the news printed in the local paper concerned which of our lads were headed overseas, and who was home on leave. Other articles included friendly competition between who could grow the most vegetables from in their Victory Gardens, and updates on the rationing of gasoline, tires, sugar, butter, and other commodities and supplies. Schoolchildren and Boy and Girl Scouts were regularly praised for starting paper drives – and collecting metal and tin, or other strategic materials, for the American "war drives". Movie theaters in Inner Southeast were packed on the weekends, as people flocked to watch musicals like Rodgers and Hammerstein's "Oklahoma" which, for the time they spent there, made them feels good during such distressing times. Also, newsreels about the war's progress were also shown every week as part of the movie show, and viewers were anxious to keep up with current events. For young folks, a visit to the Brooklyn Pharmacy or Livingston's corner store at 13th and Umatilla were the perfect solution for a boring weekend. Besides buying a soda or a fistful of candy, they could read the latest in comic books that were popular at the time. Many of their favorites included "Captain America" and "Wonder Woman" comics; and if you couldn't afford to buy them, you tried to read them in the store, until the disgruntled store clerk shooed you out the door for not purchasing anything. 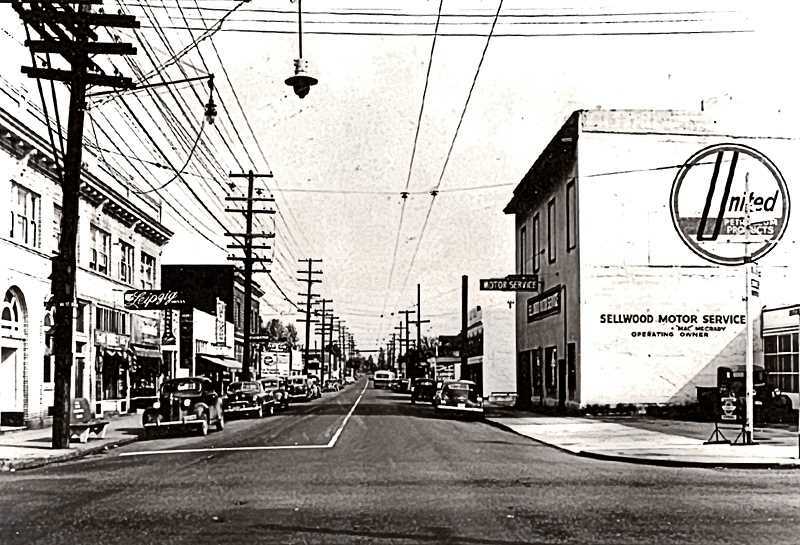 Radio set sales were at an all-time high at the Sellwood Appliance Company, where RCA radios sold for $17.95, and everyone wanted to keep abreast of the latest news of the war, or follow the radio entertainment shows. Besides the national and local news, other radio shows – this was before television – included The Life of Riley, Jack Benny, Edgar Bergen and Charlie McCarthy, The Lone Ranger, The Shadow, The Whistler, a variety of soap operas, Fibber McGee and Molly, live music remote broadcasts, and Your Hit Parade with Frank Sinatra, among many others. Residents who attended the monthly Westmoreland Community Dances refused to be bothered that there were shortages of gasoline, of food, and even a shortage of men. Girls danced with each other, or with solders when they were on leave – dancing to the popular songs "Boogie Woogie Bulge Boy", Duke Ellington's "Take the A Train", and the big bands – including that of Glenn Miller, who himself died during the war when his small plane plunged into the English Channel. World War II came to an end first with an armistice in Europe, and then months later – after four years of America battling back to regain control of the Pacific – Japan surrendered officially in 1945. Portlanders greeted their returning servicemen with open arms, and a new era of postwar prosperity began. While many of the hard times of the war years have gradually faded away and been forgotten, December 7th, 1941, remains a day and a lesson that Americans should always keep in our memories.